Home » BLDC Motor FAQ » How to Position Control the BLDC motor? The greatest challenging facing BLDC motor control is not position detection and phase switching but the starting mode. Since the back electromotive force and the rotating speed of the motor winding are positively correlated, BEMF will be too small to obtain accurate detection when the rotating speed is slow. Hence, when the electric motor starts from the rotating speed of zero, the back electromotive force method is usually inapplicable. Other methods should be adopted to first active the motor to certain speed, which can help BEMF reach the level required by detection and switch to the back electromotive force method for BLDC motor control. Only when the position of the rotor under the static condition is identified can which two switch tubes be triggered the first time upon starting. The process of identifying the rotor's initial position is known as positioning. The simplest and commonly-used method is to electrify any two phases and control the motor current from being too large. After a period of electrification, the rotor will rotate to the foreseeable position of the electrification status for positioning of the rotor. Take Fig. 1 for example. 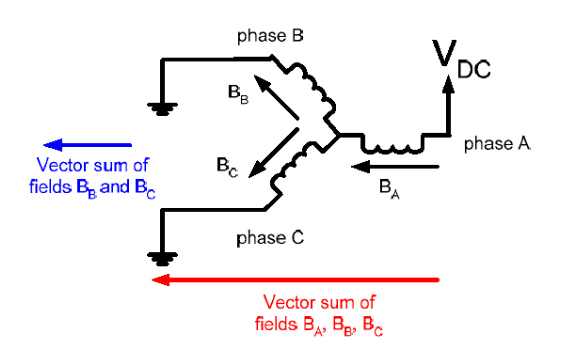 If A Phase and B Phase are connected with power, the position of the stator magnetic potential, Fa, is shown in Fig. s. At the moment, if the rotor magnetic potential, Ff, is at the position marked in Fig. 1, the rotor will rotate clockwise by the electric angel of 120°, which is aligned with the magnetic field of the stator. 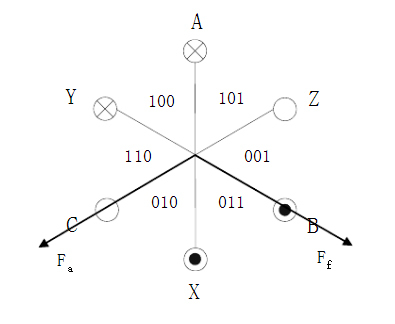 In order to avoid this problem, AC and BC should be connected with the electricity to form the magnetic field, which is vertical to Fa. The rotor will rotate to the position vertical to Fa. (Even if there is the dead lock, the rotor will be at the position at an angle of 180° with the designated direction.) After that, AB are connected with power to ensure the rotor to move to the Fa direction. A more efficient method is to detect the initial position of the stator according to changes of motor winding's inductance. This method does not rely on any characteristic of the motor, so it is applicable to any electric motor and even changes the starting load of the motor while effectively realizing positioning. Below is the working principle of the method: Impose one voltage on the coil on the permanent magnetic field. According to differences of the magnetic field, the current thus generated will enhance or weaken the intensity of the magnetic field, thus reducing or enhancing the coil inductance. The specific realization method is shown in Fig. 2. First, connect certain phase winding to the high level. Connect the other two phases with the ground. At the moment, the stator magnetic field thus generated is shown in Fig. 2. Then, change the connection of the grounded two-phase winding to the high level. In this way, the winding grounding connected to the high level will generate the magnetic field on the opposite direction. The conduction time is short under both conditions. The rotor does not move, and winding generates one current pulse. Compare the value of current pulse under these two conditions is to compare the inductance value of two windings. In this way, the stator can be positioned within the scope of 180°. Then, change to the one-phase motor winding to repeat the previous process, and position the stator in the other scope of 180°. Conduct one testing of the three-phase winding. The overlapping part of three scopes is the scope of 60° of the stator. Since every winding electrification using this method is short, there is no need to worry about overcurrent. Besides, the stator's position will not be changed, and this method can also be used to detect the stator 's position at the interval of the stator operation.